The aim of the study was to outline a simple, cost-effective technique for obturation of primary tooth root canals. A total of 75 primary teeth were treated in 52 subjects by the technique discussed, i.e. injecting plastic flowable material into the root canals after desired preparation, using disposable needle and syringe. All the patients were followed up for 3 years and 6 months, with no clinical or radiologic evidence of pathology or need for untimely extraction. In conclusion, the technique described is simple, economical, can be used with almost all filling materials used for the purpose, and is easy to master with minimal chances of failure. Pulpectomy of primary tooth has been a subject of much controversy,  owning to damage to developing permanent tooth buds and belief that the tortuous root canals of primary tooth could not be adequately negotiated, cleaned, shaped, and filled, which have led to the needless extraction and sacrifice of many primary teeth, many a times followed by space maintainers to prevent collapse of space/arch, though the space maintainers have their own set of complications, e.g. decalcification and caries as a consequence of loose bands, poor oral hygiene around space maintainers, gingival problems, deflection of erupting permanent teeth because of prolonged retention of space maintainers, and also at times loss of space because of premature loss of space maintainers, etc. However, considering the complications, cost, and comparison with preserving nature's own space maintainer, i.e. primary tooth itself; it is presumed that that there can be no better space maintainer than the patient's own primary tooth. So, all efforts should be made to preserve the primary tooth. Not too many techniques/procedures for obturation of primary tooth root canal have been described in the literature. An attempt made with 100% success (till date) is outlined and described here, after practicing over a period of 6 years and successful management of 52 subjects involving 75 primary teeth with follow-up of 3 years and 6 months . Tooth with no evidence of internal resorption. Tooth with no evidence of pulpal floor perforation. Tooth without extensive pathologic (non-physiologic) root resorption involving more than one-third of the root. Tooth with adequate bone support. Tooth with no evidence of dentigerous or follicular cyst or any pathology requiring enucleation. Tooth with no loss of tooth structure with intact enamel but shows all signs of irreversible pulpitis or a necrotic pulp. When a tooth has been planned for pulpotomy and excessive hemorrhage is encountered at the time of treatment. The stage of dental development is such that the preservation is important or desirous for at least a space maintainer. Cooperative and motivated patient and parents who desire to undergo the therapy and are willing to maintain oral hygiene and are ready for follow-ups. Extreme care should be taken to accurately diagnose the apical foramina in tooth with physiologic resorption as in these cases the apex tends to move coronally  and the actual apical foramina may not correspond with radiologic apex of the tooth, which is attributed to partial/incomplete/one-sided resorption of the root/roots [Figure 1]. During instrumentation, minimum pressure should be exerted on the canal walls especially on the inner walls, as these areas are generally thin due to physiologic resorption  and can cause perforation leading to failure. Biomechanical preparation: In biomechanical preparation, it is not necessary to give exact shape to the canals as is necessary with gutta purcha restoration of root canals. Instead it is important to reach healthy dentine right up to the apical foramina without causing lateral perforations to a minimum size of 50 in case of straight canals and 55 in case of curved canals, which allows easy insertion of 25/26 G hypodermic needle right up to the apex. An open dressing is continued till the time acute inflammation/infection (if any) persists. Closed dressing is continued till exudates (if any) of any kind are seen. After achieving desired dry canals, root canal instrument last used or sterile paper point conforming to the size of last instrument used is inserted just short of apical foramina (taking measurements from the records) so as to confirm dryness of the canals. If dry canals are achieved, the canals can be taken up for obturation. If bleeding is encountered at the apex (shows presence of healthy healing granulation tissue), a sterile gutta purcha point conforming to the root length with tight apical fit is selected and placed in the canal (without cement) for 3 days after thorough debridement, irrigation, and achieving hemostasis under strict aseptic conditions. After 3 days, the gutta purcha point is removed under aseptic conditions using No. 15/20 hedstrom file and checked for any exudates. If present, step "e" is repeated till the desired dry state of the canal is achieved. A disposable 2-ml syringe (Dispo Van, Hindustan Syringes and Medical Devices Ltd. India) with 25/26-gauge, 1.5-inch needle is taken, and the sharp edge of the needle is blunted using a sterile diamond point. The needle is bent so as to get easy access up to the apical foramina of each of the canals taking care that the length of the needle from tip to the bend is more than the measured length of the roots. Unreinforced zinc oxide (DPI Ltd. India) and eugenol (DPI Ltd.) are mixed on a sterile glass slab in a consistency enough to flow through 25/26 gauge needle under gentle pressure. In the study, we used a mix of 1:1.5 (volume by volume) liquid powder ratio. Approximately 1 ml of the material is loaded in the syringe, which is tapped on a solid surface, after fixing the piston keeping the needle side vertically upward till the bubbles entrapped get removed and the material reaches the orifice of the syringe. The needle is fixed and flow of the material is checked. A rubber stop used in root canal instruments is placed on the needle and the length is adjusted 1 mm short of measured length of root from reference point to apical foramina. Under aseptic condition, the needle is inserted into the canal right up to 1 mm short of apical foramina taking the stopper as a guide and the material is genially pushed into the canal till the material is seen flowing out of the canal orifice. Now the needle is gradually withdrawn while pushing the material till the needle reaches the pulp chamber. The syringe is withdrawn and the excess material is cleaned. A check radiograph is taken. In case of under filling, step "g" can be repeated. In case of overfilling, the filling can be removed by vagarious irrigation and steps 3 and 4 can be repeated, though minor overfilling can be ignored. After achieving desired obturation, the pulp chamber should be cleaned and filled with any fast-setting temporary filling material [Figure 2] and [Figure 3]. A total of 52 patients involving 75 primary teeth, with age ranging from 3½ to 9 years, were treated and followed up for 3 years and 6 months [Table 1], with no evidence of clinical or radiologic failure or untimely early extraction or exfoliation, except in one case with root canal fillings in four mandibular incisors, where it showed prolonged retention of lower primary incisors and imbrications of permanent incisors which erupted lingually. The patient was taken up for extraction of primary incisors and was subjected to orthodontic management. In this case, the partial resorption/non-resorption was attributed to malposition of permanent lower incisors within the jaw bone and not to pathologic involvement of tooth or root canal therapy. Review of literature on diseases of periradicular tissue and rationale of endodontic treatment  shows that the most common lesions of concern involving primary tooth fit for management by pulpectomy are acute or chronic periradicular abscess and periradicular granuloma. These pathologic conditions are the result of noxious stimuli arising from irreversible changes in the pulpal tissue. The management of these pathologic conditions involves infection control, removal of diseased pulpal tissue, and hermetic seal of the dead space in the canal. The first step toward management is achieving access to these root canals/canals, mechanical removal of the diseased tissue along with biomechanical preparation of the root canal/canals, and medicaments to control infection. The process leads to decrease in zone of infection, contamination, irritation, and stimulation, thus inducing healing. In the presence of gap within the tissue, healing is first evident by formation of healthy granulation tissue which is weak in consistency, fragile in nature, and has a tendency to fill gaps/dead space (whenever present) in the area including root canals. It was felt that this healthy healing tissue thus formed can be utilized as a barrier toward apical push of material during obturation, provided the healing tissue is prevented from encroaching the canal space and minimal pressure is used for obturation of the root canals. This was achieved by placing a snuggly fitting gutta purcha in the canal after achieving infection-free dry canal for a period of 3 days, which was enough to achieve desired properties of healing tissue. Out of 75 teeth studied, 31 required the use of gutta purcha for formation of apical barrier because of the presence of chronic infection with wide open apex with or without draining sinus. As discussed by Camp,  successful primary tooth root canal therapy requires a thorough understanding of primary pulp morphology, root formation, and the physiology of root resorption, which makes the management of non-vital primary tooth different from that of permanent tooth. The most common error in the management of primary tooth root canal filling remains accurate diagnosis of apical foramina. In the newly completed roots of the primary tooth, the apical foramina is located near the anatomic apex of the roots. After deposition of additional dentin and cementum, there are multiple apical ramifications of the pulp at the exit of the root, just as in mature permanent tooth. As resorption progresses, the apex may not correspond to the anatomic and radiologic apex, but is coronal to it, depending on the relation to the permanent tooth germ to the root of the primary tooth. Resorption may extend through one side of the root and into the canal, leaving thin opposite side of the root wall intact without a canal [Figure 1], thus creating additional communication with the apical tissue other than through the apex. To compensate for the resorption, the material of choice should be resorbable so that the resorption of the root along with the filling does not interfere with eruption of permanent tooth. The filling material of choice is unreinforced zinc oxide eugenol ,[,6] (ZOE) without a catalyst or calcium hydroxide. ,, Both the materials provide adequate working time in good consistency with or without additives. As per literature, overall result of both the filling materials appears to be almost similar. , In our study, we preferred use of ZOE as a material of choice because of easy availability and cost-effectiveness as compared to any other filling material used for the purpose, though any filling material with desired physical properties and biologic behavior can be used using this technique. Homogenous fill up to the desired depth as the obturation starts from apex upward, leaving no room for entrapment of air and formation of voids. 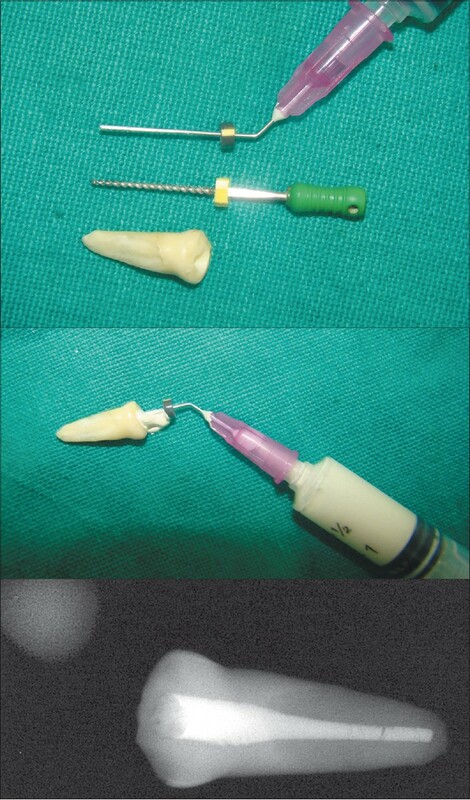 The problem of apical overfills is addressed by creation of apical barrier and use of very gentle pressure for obturation while using a loose-fitting needle into the canal so as to provide escape way for excess material without pushing the material apically. The technique allows use of any desired filling material as different workers may prefer different materials. Gives enough room for correction in case of failure. The technique described is easy to master by any dental practitioner interested in pediatric endodontics without encoring much expenditure and increasing inventory. Considering the success of obturation using the described technique as compared to other available procedures of obturation, , easy availability of all the materials used, best success of primary tooth root canal obturation using ZOE (other materials can also be used using described technique/procedure) as the material of choice, , ease of achieving homogenous stereotype filling using the described procedure, ease of mastering the technique described along with economic considerations; clinicians who wish to perform pulpectomy of primary tooth can select the technical procedure as described for better, easier, and cheaper primary tooth pulpectomy. A long-term study involving significant number of subjects is suggested for analysis toward comparison of various primary tooth root canal filling techniques and materials. 1. Cohen S, Burns RC. Pathways of pulp: Joe H Camp. Pediatric Endodontic Treatment: 6 th ed. St. Louis: Mosby; 1994. p. 633-71. 2. Ingle JI, Bakland LK, Baumgartner JC. Ingle's Endodontics 6: J Todd Milledge: Endodontic Therapy for Primary Teeth. 6 th ed. Hamilton, Ontario: BC Decker Inc; 2008. p. 1400-25. 3. Grossman LI, Oliet S, Del Rio DE. Endodontic practice; Diseases of periradicular tissue and rationale of endodontic treatment. 11 th ed. Kerala, India: Varghese Publication House; 1988. p. 78-101,116-25. 4. Goerig AC, Camp JH. Root canal treatment in primary teeth: A review. Pediatr Dent 1983;5:33-7. 5. Davis JM. Endodontic therapy in primary dentition. Dent Clin North Am 1979;23:663-71. 6. Speding RH. Root canal treatment for primary teeth. Dent Clin North Am 1973;17:105-25. 7. Chawla HS, Mani SA, Tewari A, Goyal A. Calcium Hydroxide as a root canal filling material in primary teeth: A pilot Study. J Indian Soc Pedo Prev Dent 1998;16:90-2. 8. Kielbassa AM, Attin T, Schaller HG, Helwig E. Endodontic therapy in post-irriadiated child: Review of literature and report of a case. Quintessence Int 1995;26:405-11. 9. Mani SA, Chawla HS, Tewari A, Goyal A. Evaluation of calcium hydroxide and zinc oxide as a root canal filling material in primary teeth. ASDC J Dent Child 2000;67:142-7, 83. 10. Mani SA, Chawla HS, Tewari A, Goyal A. Evaluation of calcium hydroxide and zinc oxide as a root canal filling material in primary teeth. J Dent Child 2000;67:142-7. 11. Ozalp N, Saroglu I, Sonmz H. Evaluation of various root canal filling materials in primary molar pulpectomies: An in vivo stuy. Am J Dent 2005;18:347-50. 12. Payne RG, Kenny DJ, Johnston PL. Two year Outcome study of zinc oxide eugenol root canal treatment for vital primary teeth. J Can Dent Assoc 1993;59:528-30, 533-6. 13. Subba Reddy VV, Shakunthala B. Comparative assessment of three obturating techniques in primary molars: An in-vivo study. Endodontology 1997;9:13-6. 14. Greenberg M. Filling root canals in deciduous teeth by an injection technique. Dent Dig, 1961;67:574-5 And 1965;71:544. 15. 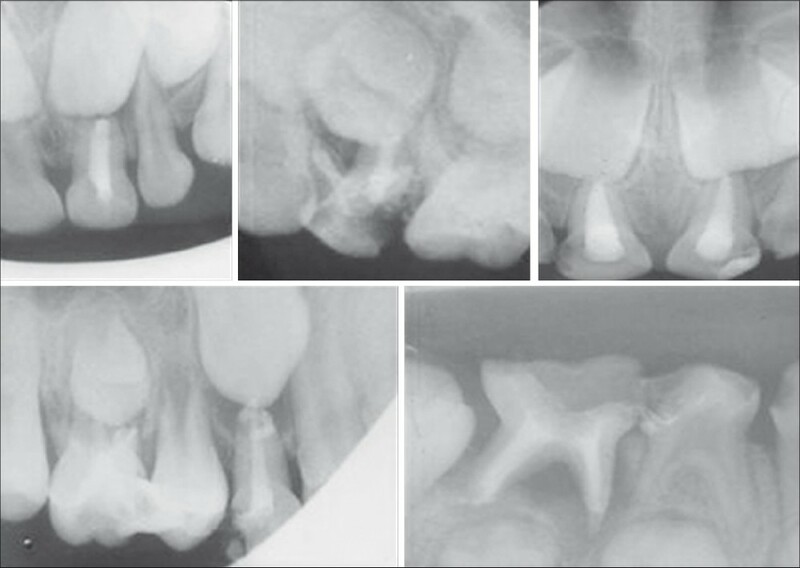 Krakow AA, Berk H. Efficient endodontic procedures with use of the pressure syringe. Dent Clin N A 1965;9:387-99. 16. Rifkin A. A simple, effective, safe, technique for canal treatment of abscessed primary teeth. J Dental Child 1980;47:435-41. 17. Nurco C, Garcia-Godoy F. Evaluation of hydroxide/iodoform past (vitapex) in root canal therapy for primary teeth. J Clin Pediatr Dent 1999;23:289-94. 18. Berk H, Krakow AA. The Endodontic Pressure Syringe. CDS Rev 1975;68:20-3. 19. Ingle JI, Bakland LK, Baumgartner JC. Ingle's Endodontics 6: In: Johnson JD, editor: Root canal filling Materials. 6 th ed. Hamilton, Ontario: BC Decker Inc.; 2008. p. 1019-43. 20. Tani-Ishii N, Teranaka T. Clinical and radiologic evaluation of root canal obturation with obtura II. J Endod 2003;29:739-42. 21. Yee FS, Marlin J, Krakaw AA, Gron P. Three dimensional obturation of the root canal using injection molding thermoplasticized dental gutta-percha. J Endod 1977;3:168-74. 22. Serene TP, Vesely J, Boackle RJ. Complement activation as a possible in vitro indication of the inflammatory potential of endodontic materials. Oral Surg 1988;65:354. 23. Pyner DA. Paresthesia of the inferior alveolar nerve caused by Hydron: A case report. J Endod 1974;6:527. 24. Guelmann M. Pulpectomies in primary incisors using three delivery systems: An in vitrostudy. J Clin Pediatr Dent 2004 Summer;28:323-6.